Thread Prompt wrote: It's time for some April showers - rain-proof your house or den, or maybe have some fun splashing in a puddle or two! “We ought to do something about this,” Lyric said, glancing up at the cracks in their “ceiling.” A raindrop fell into her eye, proving her point. Maturely, Posey giggled. Their rubble-formed den on the outskirts of Winterwynd was not weather-proof, that was for sure – but Posey didn’t mind it one bit, because it was still warmer than she was used to. There were hardly any cracks, just enough to let a little bit of weather in between the artificial and natural-formed stones or dripping in from the bark of the tree trunk. It made her feel like she was outside without being; it made her feel connected to the world. She could dream in her den and still feel the caress of the wind. Or a raindrop from an April shower, as the case may be. Posey watched her go, smiling, wiggling her ears – then joined her outside after a minute. Lyric was already shifting to her Optime form, but Posey remained on all fours, spotting a nearby puddle and leaping into it without a care. "I think it'll do..." Brom said, stepping back from the newly patched hole in the roof of the bungalow Saga had claimed only recently. While baby blue eyes sparkled with delight, chartreuse ones watched on full of skepticism. 'We'll see...' the dappled woman hummed, hands crossed over her chest, the smallest of smiles playing on her lips. The pair shared a brief moment of eye contact, brimming with teenage awkwardness, before Saga spoke again, 'Come on, we better go and see if anyone else needs a handyman', and she led the way out of the building. Despite the persistent hiss of rain, Saga soon heard other's braving the element, two familiar voices chatting between themselves. Before long, the couple (though Saga would insist otherwise) rounded a corner and came face to face with those two voices. 'Hey' the D'Angelo woman said cheerily, giving the older pair a polite smile, 'If you're trying to patch up your roof, Brom might be able to help'. The aforementioned wolfdog raised a hand in greeting, jutting his head as he did so. Teeth as white as his snowy coat flashed momentarily too as he too, let out a soft 'Hi'. Dirty water and pieces of grass speckled Posey’s legs and belly as she slogged through the puddle, enjoying the squish of the wet ground between her toes. She was used to feet wet from snow, but there was something different about spring puddles. She glanced down at her hazy reflection, watched the ripples roll out from a dozen minuscule points of contact, then turned her head at a call. 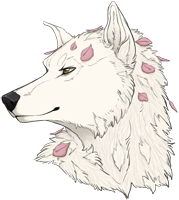 “Saga dear!” the wolf barked, turning to greet the dappled girl, then stopped to gaze at the newcomer introduced as Brom. At once, Posey’s brows jumped upward, and she wagged her tail and flashed Saga a look. “Oh dearie, where have ya been hidin’ this handsome fella away? Helloooo.” She approached him with a wag of her tail and leaned to sniff at his hands, her golden-brown eyes sparkling with mischief. There was a sudden clack of rock, and something thudded within the cavern – apparently whatever stone Lyric had shifted had fallen through. The brown wolf flattened her ears and began muttering angrily. As Posey cooed over Brom, Saga felt her eyes roll. Not for Posey's behaviour, but for the peacockish display of pride that now blossomed over the sled dog's pale face. 'I haven't been hiding him anywhere...' she sighed, 'If I had I would have kept him there'. Lime orbs flashed the elder woman a blithe glance before her accented voice moved the conversation forward, 'Brom, go up and help Lyric. Posey and I can see what we can do from down here' and she glanced at the pale woman for confirmation. With all the grace of a lame horse Brom clambered up beside the stoic daughter, giving her a rather blank, expectant look before he set to work himself. 'How've you been?' the dappled woman asked as she watched Brom idly. It had been a while since Saga had seen the older female and such a span of time felt odd considering that Posey had in fact been the first pack mate she'd ever gotten the chance to met. Though, of course, back then there had been no pack. It all felt so long ago to Saga, though she reasoned that a significant span of her young life had passed by her since, which undoubtedly had made the time feel drastically longer. The white dog preened at her fussing, but Saga didn't take the bait. She sighed and put him to work, and as he awkwardly squirreled his way up onto the mound of brick and stone, Posey flashed the salt-and-pepper girl a dark look. Lil miss grown-up, the elder complained at her, but her tail wagged. She knew she ought to have been proud of Saga, but oh, it hurt her heart to see such a youngster look so serious, much like Lyric was after they left Five Ponds. Not even a year old and already shouldering so much responsibility! She should be having fun. Posey ducked her head into her den to see what had dropped; it seemed like a big brick, nothing she could hope to move in her Lupus form. She backed away and plopped her rump on the wet earth while stones clinked above. I've been good, dearie. Rest and relaxation. Happy t' see flowers again, dontcha know—ain't something t' take for granted. Her golden-brown eyes lit on Saga again. Reckon you've been up t' a lot more, you busy little spotty-bee. Posey began to gripe, but Saga gave her a knowing grin and let the conversation drop. Truthfully there was nothing going on with Brom, nothing interesting at the very least, and more importantly, nothing Saga was prepared to be made common knowledge. Admittedly she figured that the elder had already cottoned on, but Saga was sure she could trust her to keep her lips sealed. Fun wasn't part of the woman's day to day life. Frankly, it hadn't been since she'd been very young. Serious-minded and goal orientated, such traits left little time for fun. But arguably, did Saga not find entertainment in achieving her goals? In those goals being recognised and rewarded by the Ravenking and Nightstag. She swam, and she ran, and that was fun enough for Saga. Gradually Saga made the transformation back into her feral form. It was an easy one, well practiced and quicker and quicker as time drew on. Once she was again on four paws, she slipped into the den with Posey, reluctantly sitting down as she did. Idly, a white-gloved paw swept a small patch of debris from the threshold of the den. 'I can't remember summer much', she admitted wistfully, having been so young when winter embraced the land and usurped the warmer weather. Green eyes caught Posey's amber ones and nodded softly, 'I'm a Pack Aide now', the slightest sliver of pride bursting through her matter of fact words. 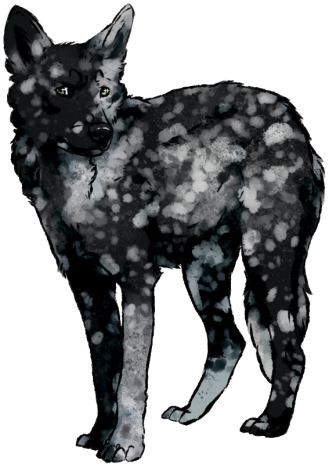 Shifting down into her Lupus form, Saga was a small thing – or at least shorter than the purebred wolf Posey. The old wolf cast her a fond look as she came to sit beneath the lip of the den with her, waving her tail across the rain-spattered ground. The realization that the girl couldn’t remember a proper summer – it must have been her birth season – made Posey gasp and look at her, her grin broadening. “Oh, lovely,” she told her. “It is a treat. It is.” Her brown eyes softened with memory. “In the north, it was ever so dark and cold most of the year, but the summer: things changin’ colors, flowers bloomin’, just fer an instant… Here it’s gonna be warmer, more full o’ life, bugs ‘n’ sunshine.” She took a deep breath and exhaled lowly with a creak of all her old bones, happy. Saga mentioned her new co-rank, green eyes looking to her, perhaps with pride or in hopes of approval, and Posey hopped to her feet. “Oh are you! I knew it!” She laughed and leaned in to plant a grandmotherly lick across the bridge of Saga’s muzzle. “You’re such a good little helper, I’m sure that’s what you’re doin’ now, huh? By whatchacallit, proxy?” She winked and lifted her gaze to where stones and branches shifted about while Brom and Lyric worked. “I’m proud o’ you, cherub,” Posey added. Posey's gasp elicited a soft smile from Saga. The elder woman's considerable collection of years obviously made the idea of having never seen summer almost laughably quaint. The dappled girl was actively curious about what summer would bring, what new challenges and experiences the warmer weather would offer up. She didn't expect much, in all honesty. What great changes could a season really bring about? The gradual switch between winter and spring had been largely uneventful, mostly because she had found it hard to pinpoint where one ended and the other began. From above, more pebbles and twigs dropped onto their heads, loose dirt raining down along with it. With a huff and a shake, Saga dusted herself free of the majority of it. That still left the floor dirtied once more and the dappled woman stood up again to brush the fallout out of the threshold and into the mud that had accumulated outside. No sooner had she finished when another sprinkling of dirt fell and Saga reluctantly remained upright to continue sweeping. The sparkle of her green eyes was rewarded by a loving peck from Posey planted on the bridge of her maw. With a shy smile, she spoke again, 'Yeah. I... just help people out with things I suppose. Finding a home, hunting,' Saga gestured upwards, 'Fixing roofs and cleaning...' Shrugging, she allowed Posey to take what she wanted from her words. Her tail thumped against the dirt floor quietly, pleased with the praise she had been given. 'I'm working towards working in diplomacy too,' the mottled girl added, continuing her idly sweeping. 'I met with traders from a pack down south heading up the river to visit Krokar - I met the Magnate from Krokar too, actually.' Saga paused again as the thumping of construction continued on the roof above their heads. 'We talked about hosting their traders at some point too.' Aside from the movement of trade that such a visit would facilitate, the chance to build relationships would likely prove invaluable. OOC: since this is older and I'm slow, I'm fine to fade this out if you'd like! Modest, Saga smiled and shrugged, but the old wolf wagged her tail—stirring up some of the dust that dropped from the ceiling. “Yep, ’s what makes a pack so grand. Everybody’s willin’ t’ lend a paw.” She tilted her head in thought. “It helps me, Saga, quite a lot. Especially at my age.” She tutted as if her status as a senior was something to scorn, though her excited body language belied this; she didn’t feel shame for her age. “I haven’t been in a proper pack in years ‘n’ years, don’tcha know,” she added. She had uncles and cousins where she grew up around PIsew Falls, but unless one could count her small family units or the Inuit tribes she cooperated with, she hadn’t had other canines around her. It had always just been her, her mates, her daughters. She laid down on the den floor, head on her paws and eyes turned up to Saga gleefully, like a puppy about to be told a great story.